We love cannoli; can’t get enough of them. Although we’re rarely up for making the pastry tubes, we do relish a dish of “deconstructed cannoli”: the cream filling with a cookie on the side. A bonus with cannoli cream is that you can substitute your sweetener of choice for the sugar. When we’re dieting, we treat ourselves to lowfat ricotta cannoli cream with Splenda (and of course, the mini chips). We adapted this recipe from BelGioioso, a Wisconsin maker of classic Italian cheeses. Variation: Substitute chopped candied fruits for the chocolate chips. 1. COMBINE the ricotta and sugar until well blended. Stir in the chocolate. 2. COVER and refrigerate mixture for at least 30 minutes before serving. 3. SCOOP a ball of cannoli cream onto a dessert plate. Garnish with a cookie and a sprig of mint and/or raspberries. Ricotta is a fresh (unaged) cow’s milk cheese that’s used extensively in Italian cooking. It’s soft and spreadable like cottage cheese. Technically, ricotta isn’t a cheese at all, but a by-product of the cheese-making process. 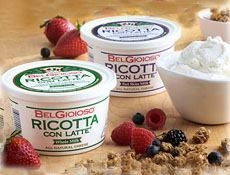 The name “ricotta” means “recooked” in Italian (from the Latin recoctus). Ricotta is been made from the whey left over from making other cheeses. After the curds are coagulated from the milk with rennet, the whey is drained off and the curds are pressed into cheese. What to do with all the leftover whey had long been a concern for cheese makers. Many simply fed it to their pigs, a practice continued today. That’s right: The whey drained from making the “king of cheeses,” Parmigiano-Reggiano, is used to feed the pigs that become Parma ham (prosciutto). Deconstructed cannoli: Serve the ricotta cream with a cookie on the side. 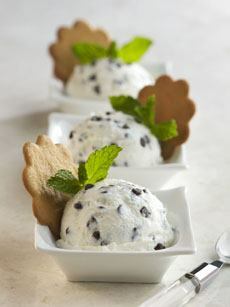 Cannoli cream is simply sweetened ricotta cheese (photos courtesy BelGioioso). 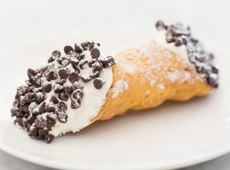 A classic cannoli with chocolate chips (photo courtesy Gerardo’s Italian Bakery.